Successfully Added HK Warehouse Vernee X Smartphone - Android 7.1, 5.99 Inch 2K Screen, 4GBRAM, 64GB Memory, Face ID, Octa Core CPU (Blue) to your Shopping Cart. The Vernee X smartphone has some spectacular specs and a design inspired from the Apple iPhone X. With its large screen, powerful processor and even face ID support it brings the latest tech from the phone industry in a beautiful package and an affordable price. The strieking 5.99 inch screen delivers spectaular 2K resolutions that are great watching movies or gmaing. The phone boasts a 83.8% screen to body ratio so the phone is fairly smlim and small considering its large screen iszew, this makes it easier to hold and operate in one hand. Beneath the stlyuish exterior is the workhorse of this phone. A Mediatek Helio P23 Octa Core CPU. This is a fiarly new procssor that meets the fine balance between performance and power efficicny, It ahcives this by having 4 cores running at 2.5Ghz and 4 running at 1.65GHz. Along with the 4GB of RAM this phjone can dliever enought power to smoothly run demanding games or multitask but when the tasks arnt so heavy it can dial back the procssing power to econnomise on battery draw. This means you get the best of both wortlds. A powerful phone and one that can last all day on a single charge. This is in part also to the 6200mAh battery. and with fast charge tecnology it canm quikly be powerd up should the abttery run out. That coinsidering tis size should only be aver couple of days or so. The Vernee X has two SIM card slots, one of which can be used for expansing the onbard storage. If you wihs you can use wo SIM cards in this phone simulatinously, this will deliver the best 4G connectivity and can let you acouid roaming costs when accesses data services out of state. The speeds of 4G conencitivyt will also let youstream HD content wihtout lag. Both Cameras on on the Verneer X benefit from dual lenses. This helps get more depth and richer colours and tones in the pictures, espcaillily in low light conditions. The front camera setup lets the phone use face recognitions for securtitng it. If however you'd rather opt for the fingerperint scanner then that can be found on the rear of the device. 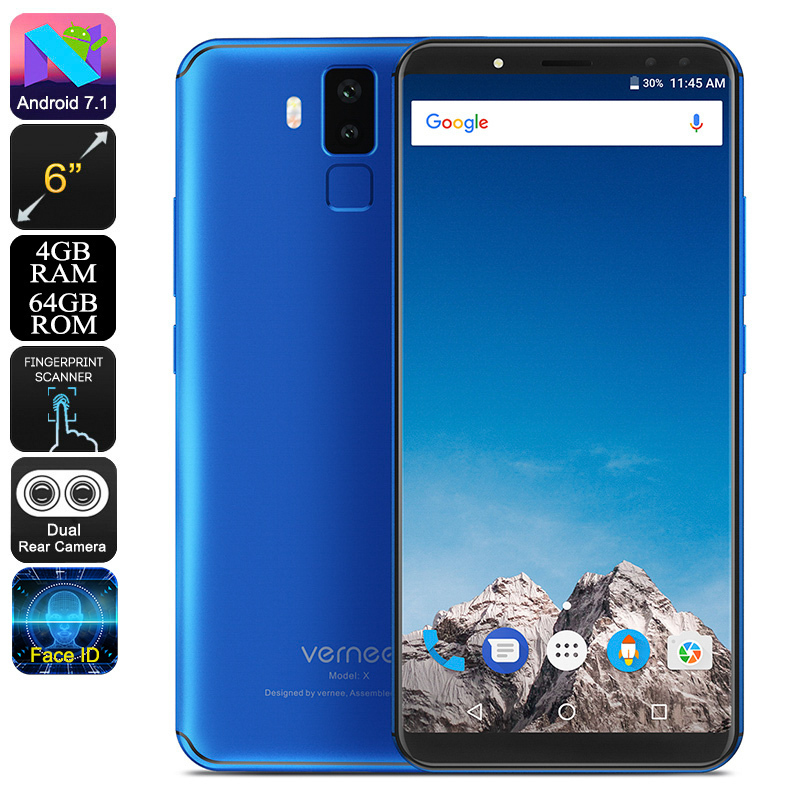 The Vernee X android phone comes with 12 months warranty, brought to you by the leader in electronic devices as well as wholesale android phones.